The Road to COP22: How do we build on the momentum started in Paris? Briefing by France,Morocco and Peru on the United Nations Climate Change Conference. There is no doubt that the recent Paris agreement produced historic results in terms of bringing governments together to act on climate change. This afternoon’s event at IFAD, Outcomes of COP21 and the Road to COP22, was a forum where presenters and discussants reflected on the process leading up to Paris, and the priority areas for action now that a sustainable framework has been established. Perin Saint-Ange, Associate Vice-President of IFAD, gave the opening remarks, which considered the role of agriculture in the Paris agreement. Agriculture is not mentioned explicitly in the Paris agreement, he said, but the preamble emphasizes that actions to address climate change should be undertaken in a manner that is coherent with sustainable development and poverty eradication efforts. In fact, agriculture features in 80 per cent of countries’ Intended Nationally Determined Contributions (INDCs), which is UN-speak for national climate plans. This sends a positive signal that countries want to take action on adapting agriculture to the effects of climate change, and reducing emissions from unsustainable farming practices, but additional finance and support is needed to help countries implement their INDCs, especially the Least Developed Countries (LDCs). 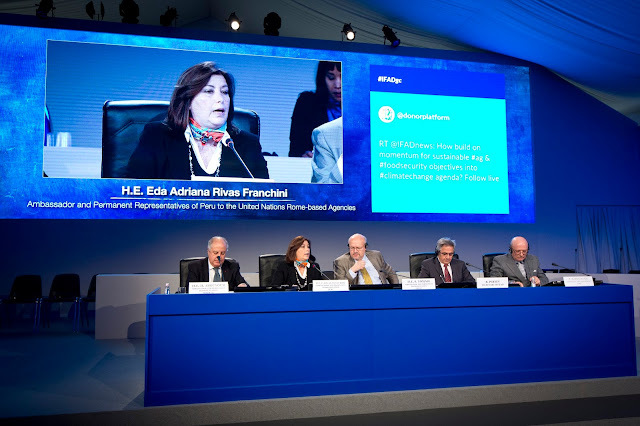 Eda Adriana Rivas Franchini, Ambassador of Peru to the UN Rome-based agencies recalled the long journey of the UNFCCC process, which had its origins in the fated Kyoto Protocol, and finally culminated with the ambitious, universal and balanced Paris agreement. Areas of dispute had to be overcome, compromises made, and longstanding divisions resolved within the principle of shared but differentiated responsibilities. As host of COP20 in Lima, Peru’s contribution to the final outcome was substantial. At the time, I attended the opening address of Environment Minister Manuel Pulgar-Vidal, which set a political impetus for results at those negotiations. In Peru the government worked behind the scenes as an impartial broker, and facilitated an environment that led to a number of successes that year, including the adoption of a mechanism to ratchet up country ambition every five years and a target to raise US $10 billion in climate finance by 2020. Indeed, Peru is one of the most vulnerable countries to climate change, whose impacts are affecting the Amazon region and the country’s glaciers, which are a crucial supply of fresh water and hydro energy. Serge Tomasi, Ambassador of France to the UN Rome-based agencies emphasized the universal nature of the Paris agreement. Adopted by 187 countries, it has put the international community on a trajectory to achieve neutral emissions by the latter half of this century. One of the critical factors that led to the success of COP21 was the high-level diplomacy brought to bear by influential figures like French Foreign Minister Laurent Fabius, who fostered the goodwill of countries and guided the Convention to adopt the final agreement. In Tomasi’s words, the Paris agreement is not a destination but a departure. It does not impose emission reductions, nor does it contain sanction powers. Rather, the targets each country has voluntarily committed themselves to will be enforced through a stock-taking exercise every five years, compelling governments to act based on a system of peer review. Lastly, Ambassador Hassan Abouyoub from future COP22 host country Morocco offered his assessment of the climate change agenda. In his remarks, Abouyoub said that Morocco was the first to anticipate climate change on the African continent. Over the last century, Morocco has experienced huge changes in rainfall patterns, to the extent that droughts now occur one in every three years. Fisheries have been heavily impacted by the warming of ocean waters and agricultural land faces chronic water shortages. Sensible policies, such as fish stock regulation and water management have been implemented by the government, but Morocco’s vulnerability to climate change is an alarming indication of more severe impacts to come. As host to COP22 this year, Abouyoub promised the same spirit of solidarity among Parties to drive enhanced action even before the Paris agreement comes into effect in 2020. Learn more about how IFAD is helping small farmers adapt to climate change.